Using twenty-seven ingredients of herbs and spices the D.O.M. stands for Deo Optimo Maximo which means - To God most good, most great. Close to its 500th birthday and produced at the Benedictine Monastery at Fecamp on the coast of Normandy, France since 1510. The monastery was destroyed during the French revolution and has since been produced by Alexandre le Grand. Don Bernado Vincelli originally designed the 'elixir' to sustain the monks in their work, and as a probably useless defence against malaria, as they were close to large marshlands, and was the first branded liqueur medicine. Medium to deep amber with a greenish-gold rim. Nose: Pronounced and complex nose offering a wealth of spice and fruit aromas. Cloves, cardamorn and liquorice mingle with honey, butterscotch, prune and orange. Palate: Pungent herbal and spicy flavours mingle with a pleasing balanced sweetness. It is intensely on the palate but displays real complexity. 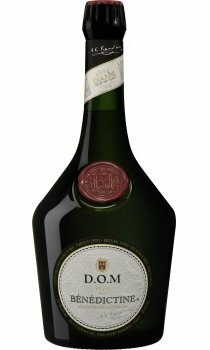 7 cocktails with Benedictine - D.O.M. The Burnley crowd are right. Beautiful, great as a short, neat. Add nothing to get that Benny kick. As great as Calvados on pancakes with honey mummy.